Bronson is a 2008 British biographical crime drama film co-written and directed by Nicolas Winding Refn and starring Tom Hardy as Michael Peterson, known from 1987 as Charles Bronson. The film follows the life of this notorious prisoner, known for violent attacks against other prisoners, guards, and governors in prison; protests, armed robbery, and art. He was renamed Charles Bronson by his fight promoter, for his bare-knuckle fighting years. Born into a respectable middle-class family, Peterson became known as one of the United Kingdom's most dangerous prisoners. Because of his violence, Bronson was repeatedly put into isolation or solitary confinement, which likely contributed to his emotional problems. The film begins with scenes from Peterson's delinquent early life which he narrates with wry humour. Initially he addresses the camera dressed in prison garb; other times he tells his tale in a vaudeville-style theatre with a live audience. The film's story unfolds as a surreal narrative of connected vignettes punctuated by vaudeville interludes. He recounts episodes of criminality and violence leading to his first prison sentence of seven years. At sentencing his mother hopes he will be out in four, however his violence in prison extends his sentence beyond seven years. He is sent to a psychiatric hospital where he continues to rebel and is administered drugs which he claims make him physically weak. His first escape attempt is simply to walk sluggishly toward the exit, where he is waved back to a chair by a staffer. He decides to escape by earning a transfer back to prison, and attempts to strangle another detainee but is apprehended before killing the man. He comments to the audience that despite all his prison time and solitary confinement, he has never killed anyone. In the vaudeville theatre he shows film footage of a rooftop protest during which he claims to have caused "tens of millions of pounds' damage". He credits this destruction with the government's decision to declare him "sane" and have him released. After a brief reunion with his parents he sets off to see his Uncle Jack. He is welcomed and reintroduced to an old prison mate who promises to set him up as a bare-knuckle boxer, and gives him the name "Charles Bronson" after the American actor. Bronson enjoys the violence and showmanship of bare-knuckle boxing. Not content with his meagre winnings, he ups the stakes by fighting two opponents at once, and even fights a dog. He proposes to a woman and steals a thousand-pound ring in the hope that she will marry him. She declines, and Bronson is sent back to jail. After sixty-nine days of freedom he is again in prison. He takes the prison librarian hostage and waits for reinforcements to arrive, alternately screaming at his hostage and peaceably enquiring after his family. When other guards arrive he strips naked and forces the librarian to assist in applying his "body armour" of petroleum jelly, to make him harder to grab in the imminent brawl. After being restrained he is warned by the prison governor that he will die inside if his behaviour does not improve. Encouraged by a prison art teacher who notices something special in his drawings, he becomes a model prisoner for a while, channelling his confusion and pain into vivid imagery of birds and grotesque creatures. When told the art studio will be closing Bronson attacks the teacher and holds him hostage. While prison officials wait outside he demands music be played. He paints his naked body black and ties the teacher to a post. He paints a moustache onto the teacher's face, forces an apple into his mouth, and removes his own hat and glasses to put on the teacher's head. After this human still-life has been arranged to his satisfaction, he accepts his fate, calling for the prison guards to burst in for yet another violent brawl, for which he will be sent back to solitary confinement. For the role, Hardy had telephone conversations with Charles Bronson, before meeting him in person. During their meetings, Bronson was so impressed by how Hardy had managed to build up his physique for the role and how good he was at imitating him, that he shaved off his trademark moustache in order for it to be used as a moustache prop for Hardy to wear in the film. Filming was done in and around the St. Ann's, Sherwood, Worksop and Welbeck Abbey areas of Nottingham and Nottinghamshire. SLENSKE: "But you were doing some crazy training for that too, like 2500 push-ups a day?" HARDY: "No, Charlie does 2500 push-ups a day, I didn't do that. I had to put on a lot of weight as quick as possible and I only had five weeks to do it, and a lot of that was fat. I ate everything. To be honest, I lost about 14 pounds of fat on this last film, and gained 28 pounds of muscle. I was heavier than I was on Bronson." 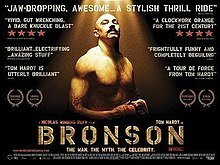 Bronson opened in a single cinema in North America and made $10,940. The film ended up earning $104,979 in the U.S with the widest release being in 10 cinemas. Internationally it made $2,155,733 for a total of $2,260,712. Upon release, Bronson received critical acclaim, with many praising Hardy's performance, the film's writing and direction, as well as the humour and the action sequences, though it was criticised for its violence. Rotten Tomatoes, a review aggregator, gives the film an approval rating of 76% based on reviews from 80 critics, with an average rating of 6.6 out of 10 with the consensus "Undeniably gripping, Bronson forces the viewer to make some hard decisions about where the line between art and exploitation lies." Metacritic gives the film a "generally favourable" average score of 71 out of 100 based on 22 reviews. "I suppose, after all, Nicolas Winding Refn, the director and co-writer of "Bronson," was wise to leave out any sort of an explanation. Can you imagine how you'd cringe if the film ended in a flashback of little Mickey undergoing childhood trauma? There is some human behavior beyond our ability to comprehend. I was reading a theory the other day that a few people just happen to be pure evil. I'm afraid I believe it. They lack any conscience, any sense of pity or empathy for their victims. But Bronson is his own victim. How do you figure that?" Bronson was not initially allowed to view the film, but had said that if his mother liked it, he was sure he would as well. According to Refn's DVD audio commentary, his mother said she loved it. On 15 November 2011, he was granted permission to view it. Describing it as "theatrical, creative, and brilliant", Bronson heaped praise upon Hardy, but disagreed on the implied distance between himself and his father; and the portrayal of Paul Edmunds, a former prisoner and nightclub owner (portrayed in the film by Matt King as 'Paul Daniels') as "a bit of a ponce". Bronson challenged his own family's reaction to the portrayal of his Uncle Jack, stating that he "loved" it, as would Jack himself. Bronson's trust in Hardy's acting grew such that once he had seen the film, he said, "If I were to die in jail then at least I live on through Britain’s No 1 actor". 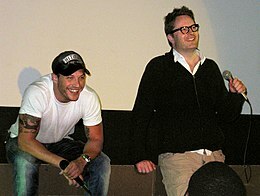 Bronson had been originally displeased with the choice of Hardy as star, but during their first meeting in person, Hardy assured him that he would "fix it". ^ "BRONSON (18)". British Board of Film Classification. 19 January 2009. Retrieved 19 October 2014. ^ a b "Bronson". Box Office Mojo. Retrieved 26 November 2011. ^ Morgan, Sion (6 Oct 2013). "Charles Bronson: 'I chopped off my moustache and sent it to actor Tom Hardy'". WalesOnline. Retrieved January 26, 2019. ^ "Film-makers invest millions in Notts". Nottinghamshire Live. 12 March 2009. Archived from the original on 16 March 2009. Retrieved 26 January 2019. ^ Slenske, Michael (October 13, 2009). "Rough Character". Interview. Retrieved August 12, 2016. ^ Ebert, Roger (October 27, 2009). "BRONSON". rogerebert.com. Retrieved January 26, 2019. ^ Bronson, Charlie (16 November 2011). "Charlie's reaction to 'Bronson'". The Charlie Bronson Appeal Fund. Archived from the original on 21 April 2013. Retrieved 26 January 2019. ^ "Tom Hardy: Becoming Bronson". Ask Men. 2008. Retrieved January 26, 2019. This page was last edited on 16 March 2019, at 17:02 (UTC).